When designing each bike, Ducati constantly aims to ensure maximum reliability and to reduce maintenance costs. A commitment that has made it possible to lengthen the times between Desmo Service scheduled maintenance checkups (during which valve clearance is checked and adjusted as needed) to 30,000 km for the Testastretta DVT 1262 engine of the XDiavel. Even the simplest checkups like the Oil Service have reached 15,000 km or 12 months. A considerable range for high performance engines, which confirms the high quality standards adopted in the choice of materials and research and development processes. In designing each bike, Ducati constantly strives to ensure maximum reliability while reducing service costs. A commitment that has seen the intervals for the main Desmo Service, in which valve clearance is checked and adjusted if necessary, to be extended to 30,000 km, 24,000 km or 12,000 km (18,000 mi, 15,000 mi or 7,000 mi respectively) depending on the model. Even the simplest of checks, such as the Oil Service, are extended to 15,000 km (9,000 mi)/12 months or 12,000 km (7,000 mi)/12 months. A considerable interval for such high-performance engines, which only confirms the high quality standards adopted in terms of material selection and R&D processes. Ducati continuously invests in the technical training of its dealers. The specific skills offered by the official Ducati Service network ensure that all those operations needed to keep every Ducati in perfect condition are thoroughly executed, while advanced equipment such as the Ducati Diagnosis System allows the software on each Ducati to be updated with the latest releases, ensuring that the electronics continue to perform at the maximum level. The constant work done by Ducati in terms of design, research and development has the specific objective of ensuring cutting-edge motorcycles characterised by the highest levels of active safety. A commitment that translates into the definition of increasingly advanced systems that increase the level of the rider’s control, as in the case of the Ducati Safety Pack (DSP), the package for the XDiavel consisting in Bosch ABS and Ducati Traction Control (DTC), both adjustable. An outfitting that optimises the dynamic behaviour of the motorcycle both during braking and acceleration, and, in this case, thanks to the Inertial Measurement Unit (IMU) it also incorporates the Cornering function for the Bosch ABS, allowing the systems to perform effectively even in curves. 93 lb-ft (126 Nm) @ 5000 rpm. The power/torque values indicated are measured using an engine dynamometer according to homologation regulation and they correspond to the homologated data, as quoted in the Bike Registration Document. Bosch fuel injection system, Full ride-by-wire system, Øeq 56 oval throttle bodies. 2 x 320 mm (12,60 in) semifloating discs, Radial Brembo monobloc 4-piston M4-32 callipers and radial master cylinder, Bosch cornering ABS as standard equipment. 265 mm (10,43 in) disc, 2-piston floating calliper, Bosch cornering ABS as standard equipment. 3,5″ TFT colour display and dedicated warning light display. 220 kg (485 lb). Weight data refers to the dry weight of the motorcycle without battery, lubricants and coolants for liquid-cooled models. 247 kg (545 lb). Kerb weights indicate total bike weight with all operating consumable liquids and a fuel tank filled to 90% of capacity (as per EC standard 93/93). Riding modes, Ducati Safety Pack (Bosch cornering ABS + DTC), DPL (Ducati Power Launch), RbW, Cruise control, Hands-free, Full-led lighting*, Backlit handlebar switches. 124 g/km – 5,3 l/100 km (Only for countries where Euro 4 standard applies). The twin-cylinder Ducati Testastretta DVT 1262 is a completely new and Euro 4 approved engine which uses the Desmodromic Variable Timing system. The increase in engine capacity compared to the Testastretta 1200, together with the use of the Desmodromic Variable Timing system, has enabled supply of incredibly full and at the same time fluid torque at low running speeds, while also guaranteeing sports performance when the throttle is fully opened. In addition, the Ducati Testastretta DVT 1262 has a particularly detailed design which, thanks to the repositioning of the water pump inside the V of the cylinders, does away with the cooling system pipes on the left side. The XDiavel is the first Ducati to use belt final drive. A must in the cruiser world, the system was developed for the XDiavel by Ducati engineers so as to be able to guarantee reliable and safe transmission of the power supplied by the Ducati Testastretta DVT 1262. 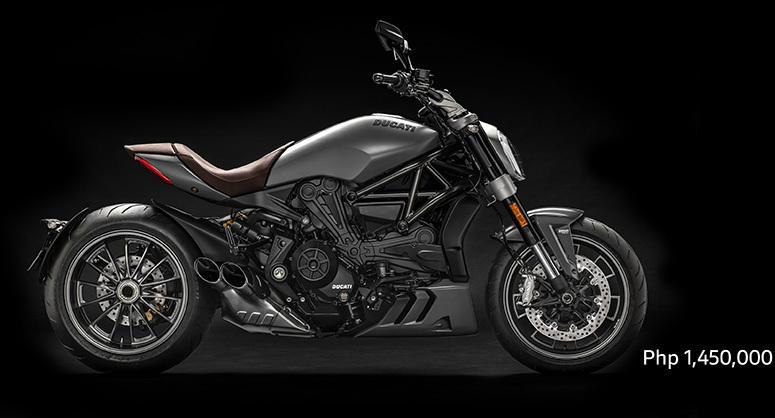 The XDiavel has 14-spoke wheels. At the front the wheel is 3.5″ x 17”, while at the back it is 8″ x 17”. XDiavel S, on the other hand, has exclusive curved 12-spoke wheels with visible finishings which highlight the design. On the front wheel is a traditional 120/70 ZR17 tyre with a redesigned tread to maximise performance in the wet, while the rear wheel is 240/45 ZR17. The covers are Pirelli Diablo Rosso II. The large rear tyre uses double compound technology to increase grip during the most extreme cornering, guaranteeing at the same time high kilometric performance and applying Enhanced Patch Technology to maximise the contact area with any lean angle. The tread design and the compounds used guarantee exceptional performance in all conditions, especially in the wet. If, on the other hand, you love the liberty of your XDiavel and the carefree feeling it inspires, you could choose the Touring kit. A refined “Supercomfort” saddle, a Roadster nose fairing and a handy magnetic tank-bag are all you need to climb on and let your sensations lead the way.